A topical gel designed for external application for temporary relief of minor pains, bruises, and sprains associated with muscle and joint injuries. Now labeled for both horse and rider. Provides the benefits of epsom salt in a rub. Relieves soreness and relaxes muscles. Can be used on abscessed hooves. Apply directly to painful muscles, tendons, and joints. Repeat as needed for relief of soreness and to relax muscles. 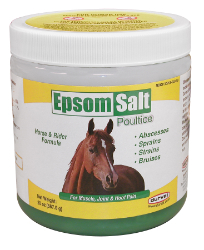 Epsom salt poultice can be covered with cotton or wrap. For drawing infection and soreness from horse’s hooves, pack the frog or abscessed area and cover with wrap or attach a boot to protect the hoof. For Human Use: For external use only. Apply to affected areas, repeat as needed not more than 4 times daily. If possible bandage lightly. If symptoms persist more than 7 days or clear up and return, discontinue use and consult a physician. Do not use on children under 12 years of age.